After a few credits roll at the end of ASM, you see Connors being left in a prison cell for his attempt to make New York City a little more slimy. As he sits down, Connors is confronted by an individual coming from of the corner of the cell. The man is completely wrapped in darkness and we cannot see any determinable features. All we can make out is that the mystery man is wearing a trench coat with a fedora that he plays with continually to show aged hands. The mystery man asks Connors if he had told Peter what Peter’s father had done. Connors gets visibly upset (we see some scales showing that indicate maybe he is not completely cured from being the Lizard) and yells at the man. The man then disappears from the cell as he walks into the shadows in the corner of the cell. Wow, that is a lot to process especially if you are not a comic book nerd. Let me help you try to go through this short scene, some of which will be guesswork. First off, who is this mystery man? A few of the speculations I have already heard online go from Mysterio, the Spot, the Chameleon, or even Norman Osborn himself. I do not believe it is the Green Goblin, but another emerald villain. Adrian Toomes, also known as the Vulture, is a brilliant inventor turned high-flying criminal. Toomes would invent an anti-gravity harness that allows him to fly. The harness also allows him to augment his strength. All of this would allow this old man to be as swift and strong as Spider-Man. Why do I believe the Vulture will be slated for the next Spider-Man movie? The world created in The Amazing Spider-Man is a technology filled wonder. We see genetics, formulas and even some good ol’ fashioned DIY device building. The main villain in this movie, the Lizard, is the product of animal/human hybrid genetics. You can even go as far as the video game tie with the main villain being the Rhino, who is stated to be an animal/human hybrid instead of a normal man in an armored suit. Then of course there is Spider-Man himself. We can assume that this series will continue playing with the idea of genetics, maybe giving Toomes a new lease on life with vulture genetics. He would also supplement his new abilities with the previously mentioned harness, very much like Spider-Man did with his invention of the webshooters. Then let’s not forget that the person visiting Conners is visibly older. There is no other person in the Spider-Man rogues gallery that is that old that would provide a threat to Spider-Man (well maybe Silvermane, but I do not think they would go that obscure). The mystery man hunched over wearing a trench coat, much like how Toomes is depicted often in the comics when not in cosutme. The hunch/trench coat combo would come from old age and disguising his wings. His wings would also suggest how he got in and out of the cell without alarming anyone else. Now what about the question that the mystery man asks? I have just one theory. In the Ultimate Universe of Marvel Comics, the Ultimate version of Spider-Man had his DNA tampered with as a child by his father. This tampering mixed with the radioactive spider would cause the story we all know. I mean, seriously, how many other people had to have been bitten by those spiders and none of them are wall crawling. This would lead up to a conflict if Peter’s parents ever reappear in the movies, because we all know what without a body nothing can be proven. Again, this is all speculation. This end of movie scene is a lot more indirect than the other Marvel movies, then again it is Sony handling the movie instead of Marvel Studios. Either way, I hope you enjoyed this movie as much as I did. I believe the character from the shadows was the Vulture also. It was obviously an older man. There actually was rumors that John Malkovich was set to play The Vulture in Spider-Man 4 before the idea to reboot came up. It would be possible that maybe he and writers were still interested in the role. Personally, I think that he’d do great as the villain if played with similar style and attitude that he showed us in RED. Just the fact that the old man creeped out of the shadows like that made me think of the Vulture right away. Your speculations are are very likely to be true. Vulture would make for an interesting and entertaining villain. Thanks. 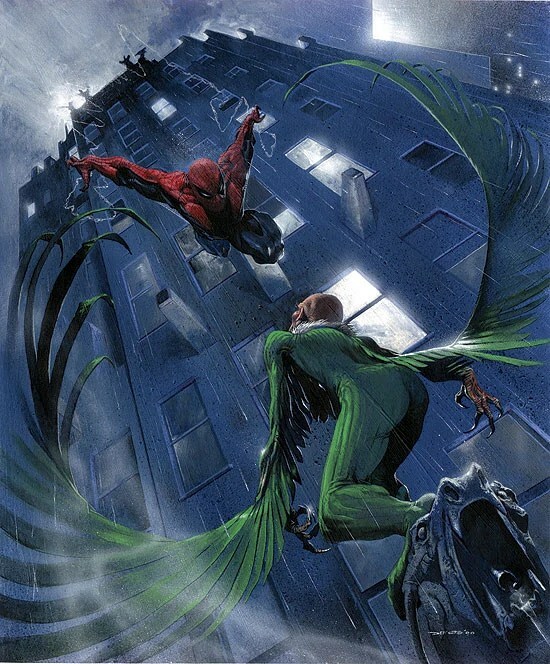 With the Vulture being so dynamic as someone who can fly, I definitely think he will be the most exciting choice to put into the next movie. Not to mention they have yet to put the character on screen. I think the person at the end of the movie is Peter Parker’s Dad. Earlier in the movie Dr. Conners was asked “does peter know what you did to his parents? ?” Then again at the end he was asked the same question. So I believe it has something to do with his dad…he might be alive and was the one who performed the first human trial on himself. I do think he is alive and will play a part in the next movie (but will probably die in the dame movie). However, I think along the lines of how the Marvel Studios movies do these scenes, they would try to introduce a villain or another hero at the very least. Great review Danny! It was useful to me. Thank you. Hopefully you’ll find more stuff you like on the site! I’ll be the first to state,correctly(mind you)..
That the man in the cell with Dr.Connors is the Living Vampire Morbius!! !He could easily get into the cell by hypnotizing guards to get in,and/OR morphing to fit through small places,lk under the door or through vents..Dr.Michael Morbius was experimenting with bats to fix his rare blood disorder when Dr.Ratha forced him to finish work with Dr.Connor,which resulted in Dr.Connor becoming the Lizard.After that was accomplished,he was able to finish his own research and becamethe pseudo vampire Morbius…Yes,Norman Osborn may play a big part in the Amazing series,but he wont kill Gwen Stacy til after Morbius is introduced..there is a bit of forshadowing,i thinkbecause the mysterious man is shown in the moonlight.and his old looking skin could resemble that of a vampire..thats my guess on who it is..anyone know anything that would nullify my argument??? My only counter is that Morbius may be a little too obscure for movie audiences. Of course, I may be completely wrong. But that’s the great thing about this credits scene, it gets us talking about it a week after the movie came out. Or it could be Dr. Jackal, he was a demon like person disguised as an old man but was experimenting on Parker’s DNA making clones such as scarlet spider and Kane spider and so on… he also had the ability to appear and disappear since he’s not human. He was also a villain in the older comics seen as an old man in the shadows wearing a fedora and trench coat (some versions were Osborn doing the same). Completely agree it being better. And who knows maybe the next villain is a lab rat for the serum before Osborn. I totally agree. Now that casting has started for the sequel, rumors are also supporting the idea of Electro. Check out my take on the end credits, check it out here. Electro would introduce Spiderman connection with Avengers thru Stark Industries. Which I hope they don’t, like how it is now. I think Marvel will stay away from the whole Vampire concept as to separate itself from the Twilight and True Blood madness, they pretty much saturated the market. Marvel would need to go ol’ school, which they have been lately as well as DC. Both have re-introduced heros to build up to bigger things. For DC, I see maybe a Justice League movie being established. Now that jammie foxx is casted as electro, would be way to simple, I believe that the mystery man is the tinkerer. While the next step in my guessing includes the Sinister Six with Mysterio as a member and maybe Norman controlling the situation, I’m curious as to what you mean by the contours work for Oscorp. Would you mind explaining? I think the Vulture would be brilliant to see in the next movie although I can’t help but think its Norman Osbourne. Mainly due to the many hints about Gwen being killed off in the next movie. The villian in the comics was the Green Goblin who kidnapped her which then resulted in her death. While I would love to see how they interpret Green Goblin and the Death of Gwen Stacy story, for some reason I do not see Norman as the main villain for the second movie. Of course, he may be the one pulling all the strings but I’m not sure he will dress up. And from what we know at the moment, I do not believe they will kill Gwen until the third movie. I think this may be referred to as the “Gwen Trilogy” of the Spider-Man movies. Marvel has build up their characters for the Avenger movie. If they planned on Spiderman joining the team then the would have to rebuild his character, hence the new Spiderman movie. If their plan is to bring Spidey over to Avengers then they would have to cross somehow. Seeing the Electro is connected to Stark Industries, the rumors maybe true. But, Electro has nothing to do with Peter’s parents because Electro was created by accident while working on powerlines. This does not match up to the “mystery person” commenting about what Peter’s parent did. Unfortunately, Spidey does not look like he will join the Avengers as long as Sony has the rights to the Spider-Man movie franchise. But we have to remember that what may be comic book canon may not be movie canon, and Electro may actually be part of the Parkers’ past. I guess we’ll just have to wait and see.